After looking at modern variants of the old Filtertron® style pickups, and wanting to replicate the original twang & growl of the original '50s versions, I came up with these - introducing the Black Cat 'No Ears' Mount Filtertron® style pickups - True to the original specifications for that brighter, attacking rock, rockabilly & blues sound. A reduced number of offset winds on each coil provide the extra brightness. The much thicker Alnico 5 magnet helps keep the attack but being stronger due to their 1/4" height, the magnet boosts the output of the lower windings on each coil to give great volume & brightness. A real spank & twang to these Creamery Classic Black Cat Filtertron® stye pickups. 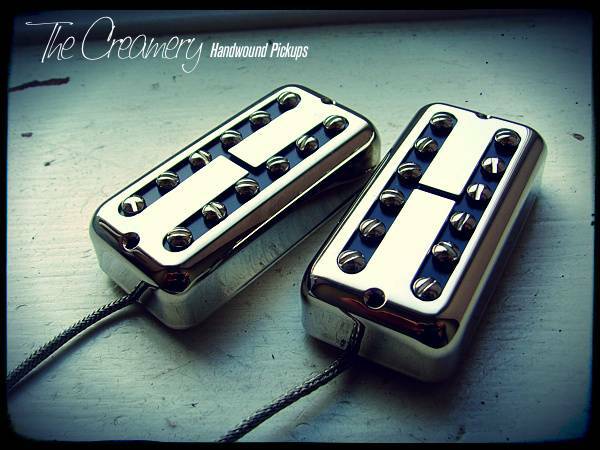 Currently, the brightest humbucker pickup in the whole Creamery range. The Black Cat bridge pickup is jangly, attacking, powerful & bright, designed to break up the amp at gain for good bite. 12 Pole screws for dialling in individual string balance give you the option to follow your neck radius and define your own sound. The Black Cat Neck pickup has a sweeter voice due to its position but still with the attack & brightness you'd expect from the classic Filtertron® design. These are a direct drop-in replacement for the standard 'No Ears' mount Gretsch & Cabronita pickups.